Beauty comes in all shapes and sizes, and owning it fully is powHERful. Lorna Ketler, owner and founder of Bodacious Lifestyles Inc., is a woman to be celebrated. She passionately encourages women to fully recognize and appreciate their beauty, their bodies and their curves! Living on a boat in False Creek, Lorna delights in seeing the world with a fresh perspective. Just a year ago, she decided that every month for the next year she needed to create “epic” experiences in her world starting with walking 100 km of the Camino de Santiago on her 50th birthday. That completed, she’s filled her months with big and small experiences, including jewelry-making classes, jumping off the back of her boat for a swim at Gambier (so awesome! ), painting workshops, travel and most importantly, precious times with friends. She’s just recently started a ukulele class with her hubby. Way to go, Lorna! 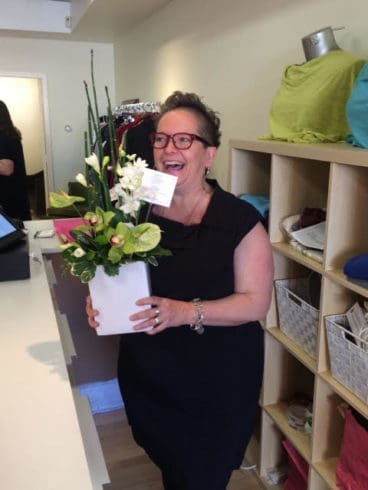 To kick-off her 51st “epic” year, Lorna recently opened her second boutique at #2 – 1113 Langley Street (behind Murchie’s) in Victoria, BC. She welcomes Vancouver Island powHERful peeps to stop by and say hello. You’ll find fashions in sizes 10-24 from a number of quality designers including: Canadian lines: Joseph Ribkoff, Sympli Grand, & Chloe Angus Designs as well as other delicious fashions from the US, Australia and Israel! And don’t forget to accessorize with their awesome selection of jewelry, handbags, hats and so much more! Matt & Nat handbags and wallets, LotusLand & Irit Sorokin jewelry, Marigold Collective silk and linen scarves. As awesome as the fashions are at her Bodacious boutiques, what you’ll find when you walk through the door is a fun, safe, welcoming environment where all bodies are beautiful and worthy of clothing that celebrates YOU! Welcome Lorna! Thank you for supporting PowHERtalks Victoria and for all that you do! PowHERtalks Victoria tickets available here.